The Redfin Housing Demand Index fell 1.3 percent month over month to 106 in April, the third consecutive month of declines. From March to April, the seasonally adjusted number of buyers requesting home tours dropped 1.4 percent, while the number of buyers making offers fell 1.8 percent. Looking at year-over-year comparisons, the Demand Index declined 11.5 percent from April 2017. The number of buyers requesting home tours dropped 3.7 percent year over year, and the number of buyers making offers fell 22.1 percent. Across the 15 metros covered by the Demand Index, the number of homes for sale fell 7.3 percent year over year in April, the 35th consecutive month of falling supply. However, newly listed homes for sale increased 6.6 percent in April compared to a year earlier. 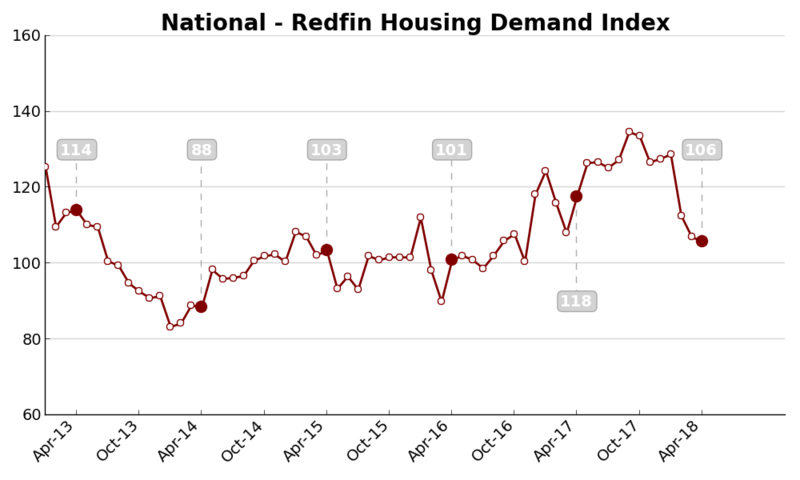 For more detail on the Redfin Demand Index methodology, click here.